Sorry I've been M.I.A for a while now. Since my last post, I was just swamped with college work and then exams crept up and before I knew it, it had been two months since I last posted anything. Since I'm on my summer holidays now, I'll (hopefully) be posting a lot more. So, getting into today's post. A few months ago (again, sorry, this was meant to be up ages ago! 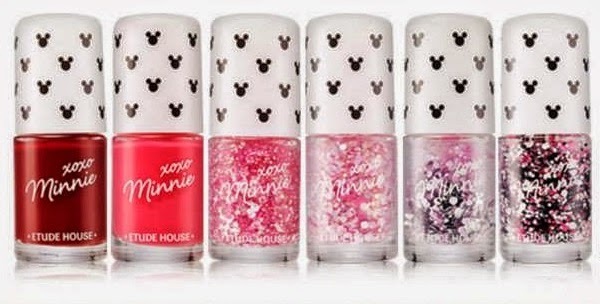 ), a bought some of the nail polishes from Etude House's Minnie Mouse Collection. In total, there are 6 polishes in the collection: two are just plain colours and the other four are Minnie Mouse themed glitters. I bought the four glitter ones, I didn't find the plain ones too exciting but the glitters looked amazing. I also bought another polish from Etude House (I'll probably write about it soon, but if you want to check it out now, I used it in my last nail art video) and the store I got them from also gave me a free polish. So far, I've tried two out of the four Minnie glitters: #5 Minnie Silver Ribbon and #6 Minnie Black Face. Minnie Silver Ribbon consists of, as the name suggests, Minnie's signature bows in silver, along with some smaller lilac and white glitter particles, all suspended in a clear base. The bows were difficult to fish out at first, but once I got the hang of it it wasn't so bad. Annoying, but not awful, you need a bit of patience for these polishes. If you were going to buy this, I'd suggest you dab on the glitter pieces as opposed to applying like a regular polish. It takes a while to get the glitter on, so if you apply it normally, you'll be adding unnecessary layers of the clear polish, which will just make the whole thing end up looking like a mess. Minnie Black Face consists of black 'Minnie' heads and smaller pieces of pink and white glitter. Now, I don't know about you, but to me these look a lot more like Mickey's head than Minnie's. This collection is supposed to be Minnie Mouse themed, but the head shaped glitters seem more Mickey than Minnie, and the design on the cap is also Mickey, not Minnie. I can understand for the glitters, since they did the bows in a separate polish, but the cap design should have included bows. Moving past that and onto the polish itself, I can honestly say this was easier to apply than the last one. Maybe it was easier to get the pieces out, or maybe I just got better at it, either way I did manage to get more of the glitter onto the nail with this one. Same rule applied here: I dabbed the glitter and head pieces on as opposed to applying normally. I used a topcoat on Minnie Silver Ribbon, but not Minnie Black Face. These polishes NEED a topcoat. The Silver Ribbon one lasted a good few days (can't remember exactly how many, but I took it off because I wanted to paint my nails a different colour, not because they'd started to chip away). The Black Face one didn't last nearly as long: just a few hours later, one of the black heads was missing, and I took the rest of it off when I got home. Besides making the polish last a lot longer, you really need that layer of topcoat to even everything out. Since the glitter was dabbed on, it can look really patchy and weird, but a layer of topcoat really smooths things out. Overall, I do love the look of these polishes. They're very different to anything else I own, and I'm a huge Disney fan (aren't we all? ), which just makes these even more exciting for me. They're also quite cheap, which is great (obviously). I'll be trying out the other two polishes I got from this collection soon, so keep your eyes peeled for that post.